You think you know waffles. You don't know waffles. Unless you've spent time in Belgium. But I'm not talking about what Americans call "Belgian waffles." Hah! 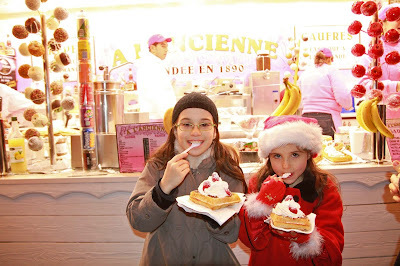 In Belgium, there are gaufres (waffles) de Liège and gaufres de Bruxelles. Yes, one of them is what you think of as a Belgian waffle; but it's not the one you should be eating. If you're a waffle connoisseur, a waffle fanatic, do all roads lead to Liège? It's the home of the Liège waffle and when we are in Belgium, we go into the city -- twice -- just to find authentic waffles. We find our favorite ones at VitalGaufre (which is fitting, because, really, we think it's vital to get a gaufre) immediately outside the parking garage. Now that's service! They have some creative flavors, which we try ("I'll trade you a bit of my raspberry for a bite of your blueberry"), but in the end, it's clearly the vanilla -- plain ole' basic vanilla -- that is everybody's favorite. The other store we try is the almost unpronounceable Une Gaufrette Saperlipopette, the #1 waffle and bakery spot in all of Liège on TripAdvisor and highly recommended by our B&B hostess. The first time we go there, it's actually sold out, which partly explains why we return to Liège in the first place (or, rather, in the second place). The second time, we get there early, wait on line, and in the rain. Our hands are full of a huge variety of waffles (one of them filled with mango pie filling) and umbrellas. So I do not get a photo. I get a mouthful, and a belly-full. To be honest, we all prefer VitalGaufre, and we don't think it's just because we had that on an empty stomach, whereas Saperlipopette is our two-waffle dessert after a dinner of waffles (and fries. We are on vacation in Belgium, after all). The batter for a Liège waffle is thick, almost bready, and the resulting waffle has jagged edges, a much denser and moister crumb, and a sticky sweet crust, with the occasional chewy crunch in the middle, from large sugar crystals purposely scattered in the batter. You don't have to go to Liège for the best Liège waffles. But, as far as we can tell, you do have to at least go to Belgium. There are Liège waffles in Brussels, so very many waffle shops, the most famous of which is Le Funambule ("tightrope walker"), right next to the world-renowned Manneken Pis statue, a tiny statue of a boy peeing, which seems to be the Paris Hilton of tourist sites: famous for being famous. And for having a lot of outfits (apparently, he has almost 1,000 outfits). At first, we try our Funambule waffles with the works, but over time, we refine our ordering technique as we discover we like the unadulterated flavor of the waffles best. Or, adulterated with just some strawberries. But the cream and the chocolate sauce are too much! We become purists, even the children. These Funambule waffles are so good, we drive out of our way to buy some on our way to the train station to get out of the country. We will almost -- almost -- regret this, when we are then hampered by an outdoor market, a GPS that wants us to go where the market is, and no signage at the train station for car rental return. By the time we find it, we literally open the doors before the car has stopped and throw the keys at the attendant. We race through the train station and arrive one minute after our train's scheduled departure time, but by some good luck, the train is five minutes late, so we make it. How do we celebrate? By breaking out our waffles, of course. This brings me back to France (not just by train but by subject matter): In France, gaufres are almost as ubiquitous as crêpes, and often sold at the same places. But buyer beware: they are virtually always the gaufre de Bruxelles -- the Brussels waffle. The worst kind of waffle. The kind of waffle that's basically like an American waffle. A toaster waffle. Even a high-quality American pancake house so-called "Belgian waffle". They are indeed Belgian, but more specifically, they are Brussels waffles. Brussels waffles are crispy on the outside, and light and airy on the inside. The batter is thinner, so it spreads evenly and makes a nice, even rectangle. This description makes them sound delicious, I know. But the truth is, they don't have much flavor. They need powdered sugar or syrup or some sort of topping. Basically, they serve as a bready vehicle for the sugary substance you put on top. As opposed to a Liège waffle, which is like a delicious cake all by itself. In this French convenience store, they are trying to make this one (below) look like a Liège waffle -- the uneven edges, the almost circular shape. But don't be fooled: a true gaufre de Liège is best served warm and -- certainly -- never comes hard and stale in a plastic case. I snub my nose at this. So, yes, I can honestly say I've met many a waffle I don't like. But that's not to say you can't occasionally enjoy a French waffle -- a gaufre de Bruxelles, that is, or Belgian waffle, here in France. Pippa, who doesn't like crepes too much (sacrilege, I know), often opts for the waffle. You just have to set your expectations lower. But now that she's experienced the real thing -- the gaufre de Liège, will Pippa ever again be happy with a "Belgian" (that is, Brussels-style) waffle? (No.) Will any of us? (No.) Will we have to find the perfect Liège waffle recipe and buy a special waffle-maker when we go back to the US, just so we can have perfect Liège waffles? (Clearly.) Is it really worth it? Why, yes; I won't even waffle on my decision. For a true Liège waffle, it would definitely be worth it. I have also seen the Briquette de l'Ardèche sold as La Brique Ardéchoise. Either way, it's a premium cheese made from raw goats' milk in the heart of the Rhône-Alpes region, in the Ardèche department, name for the Ardèche river. It's about the size and shape of an actual brick (hence the name). The texture is soft, silky, oozy, buttery, unctuous. And the flavor is complex, with notes of vegetables, herbs, and flowers. One's a cheese, one's a waffle, and you're probably not going to confuse the two, but Briquette de l'Ardeche kind of looks like a waffle -- a Belgian waffle, a Brussels waffle: rectangular, slightly golden, and, if not quite checkered, at least striped. The locale identifier in the name is very important in both cases. The geographical style of your briquette is almost as important as that of your gaufre. If I were going to have a snack and was given a choice, I wouldn't waffle at all: My order of preference would be Gaufre de Liège, Briquette de l'Ardèche, and last -- and very much least -- Gaufre de Bruxelles (that is, nearly every French gaufre or American "Belgian" waffle). Just two weeks ago we coincidentally were served Gaufre de Liège at a Novotel breakfast in Aix-en-Provence. It was our first discover of the the Liège waffles in France. Our kids now consider this Novotel's breakfast the best hotel breakfast they've ever had.